If passengers arrive at their destination over three hours late due to a missed connecting flight, you have the right to compensation as well as some additional benefits at the airport. Based on the EU Passenger Rights Regulation, you be due €250 to 600 € in compensation. Additionally, the Airline must provide you with foods and drinks from 2 hours waiting time. The airline should re-book the passenger on the next available flight or in the case of the next outbound flight being the next morning, the airline should either provide booking for another airline or provide accomodations and meals. What happens if I miss a connecting flight due to a delay? What should I do if I miss a connecting flight due to flight delay? When do passengers receive compensation for a missed connecting flight? There have been a number of court decisions that have strengthened air passenger rights in favour of the consumer. The European Court of Justice (ECJ) in Luxembourg and the German Federal Court of Justice (BGH) have both issued consumer-friendly rulings stating: Passengers can also receive compensation for major delays affecting flights consisting of several legs. The flight plan needs to be all in one booking for this to apply. What conditions need to be met in order for me to claim compensation? The main prerequisite to consider when wondering if you have a valid compensation claim is whether or not the flight in question actually qualifies under the European Regulation No. 261/2004. Note: The regulation applies to all flights taking off from an airport in the European Union. It is also applicable to flights landing in the EU, provided that the head office of the airline that operated the flight is also in the European Union. Moreover, all passengers (except those who have benefited from a price not open to the public) are protected by these provisions in case of missed connection following a flight delay or flight cancellation. It is possible to claim on flights dating as far back as 6 years. This regulation applies to business travelers, passengers flying with a low-cost airline, people traveling with a package holiday or children who paid a ticket price. Important: Even if you have been provided with vouchers, food and refreshments or a hotel stay by the airline, you are still able to make a compensatory claim. What if my connecting flights are operated by different airlines? If a flight delay leads to a passenger missing a connecting flight, and the delay at the final destination is 3 hours or more than 3 hours, they have a valid claim for compensation. The flight plan needs to be all one booking for this to apply - although it does not matter if you have a mix of different airlines in that booking. If a passenger has booked all legs of their journey with one single booking the airline must offer alternative transportation as soon as possible. 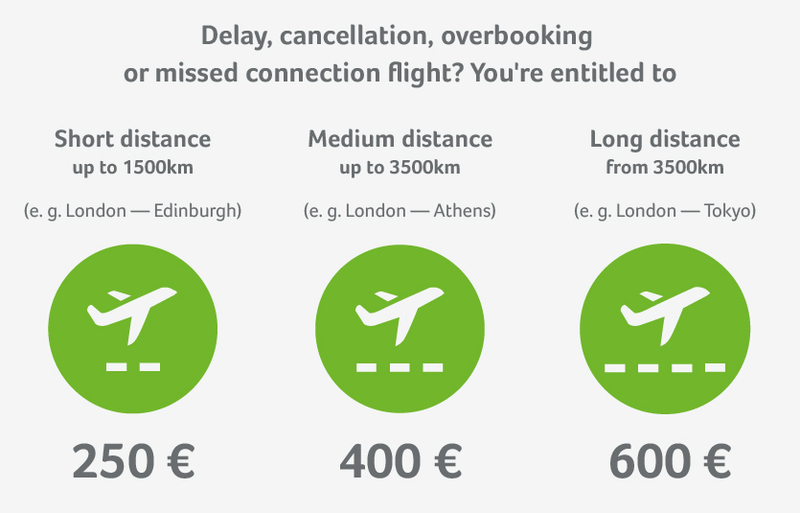 If the passenger has booked the flights separately - with different airlines, and the first is delayed, there is nothing to be done if they miss their connecting flight. Additionally, they don’t have the right for alternative transportation organized by the airline. Firstly, you’ll want to check whether or not your flight disruption fits the necessary criteria for you to have a valid claim. This can be a somewhat complicated procedure - you’ll need to figure out if you meet the conditions laid out in the European Regulation No. 261/2004, you may also need to compare the circumstances of your missed connection with similar cases and may even need to access flight databases. All of this can take a lot of effort for a consumer, can be hard to understand and ultimately prove frustrating. As a European legal aviation expert, this is our specialty. We can determine within a matter of minutes whether you qualify for compensation. Simply enter your flight information into our unique compensation calculator to ascertain verification. The claim check analyzes hundreds of thousands of flights and the corresponding meteorological data and assesses whether the European Regulation No. 261/2004 applies to your case. By using this you receive a free evaluation of your situation. Over 3.2 million customers have already put their faith in us. Enter your details below to get started. If the claim check shows that you qualify for compensation for your missed connecting flight, you can have us asserting your claim immediately. The optimal method of receiving your compensation, in a hassle free manner, is to sign your case over to us. We know what the airlines are like and what moves they typically make to avoid paying passengers the compensation they are owed. This allows us to represent our customers’ interests on a level playing field with the airlines. We’ll make sure that you get the compensation you’re entitled to, even if it means going to court, where we currently have a 98% enforcement success rate. What if my flight is delayed for more than 5 hours? If the flight departure is delayed for over 5 hours, passengers are within their rights to withdraw from the flight. They can request alternative transportation or can demand a full reimbursement for the ticket. What if my flight is delayed until the following day? If departure is moved to the following day, the EU regulation states that the airline is obliged to find their passengers accommodation in a hotel for the night. The airline must also cover any costs of getting the customers to and from the hotel and airport. What are extraordinary circumstances in case of a missed connection flight? Sometimes exceptions are made in situations where it turns out the airline could have prevented the problem. One example of this is if the airline cites severe weather conditions as a reason for disruption, and the actual problem was that they failed to bring enough supplies of de-icer. Although the airline would be responsible in this case, it is not something the average passenger can prove easily. Our experts have access to specialised databases that allow them to establish the airline’s liability which will greatly increase the chances of receiving compensation in cases such as these. You might be entitled to compensation from €250 to €600 if you arrive at your final destination 3 or more than 3 hours later than planned.